Posting for the Scrappiness Nov-Dec challenge. The theme is Christmas, and the project must feature layers, flowers and gems. 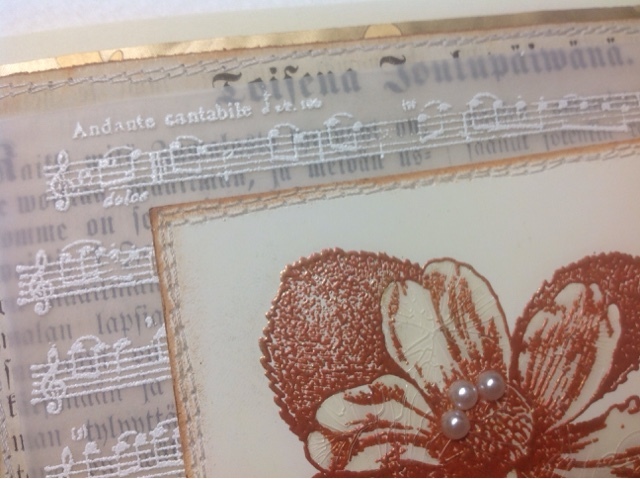 My layout has been much inspired by this lovely card Susan featured on the Rubberdance blog some time ago. I've been doing lots of bright coloured Christmas cards, so I chose a neutral metallic blend for this card. 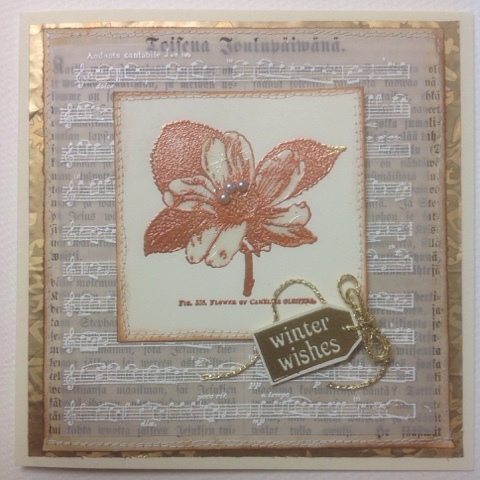 I have used stamps from Rubberdance and heat embossing for this. My layers are golden gift wrap, old bookpaper from a sermon collection from about 1850 and vellum with the music background heat embossed in WOW Seafoam white. 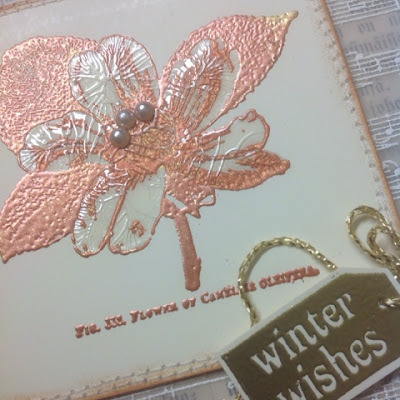 The camelia flower was embossed with Copper pearl and the little tag with gold. I filled in the flower with Crackle Accents. I had a bit of trouble deciding the gems, but solved my problem with three half pearls adhered to the flower. I love how the texts from the layers show. The sermon starts with the heading "On the Second Day of Christmas" (the large letters you can see at the top, in Finnish it requires only two words...) and "Andante cantabile" and "dolce" on the music sheet are just perfect! Lovely card, Kristiina! Nice to see that Susan's card inspired you. I really like the way the embossed vellum looks.